You asked for it. 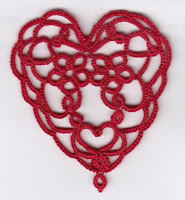 I created the pattern for the heart shown yesterday. The final result is a pretty heart with a pair of kissing flowers. But to get there from here certainly isn't elegant. I tatted it with the dimpled ring and the little ring below it done first and set aside. 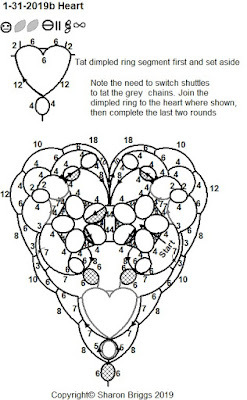 The heart begins with a 5 ring flower that ends with a split ring split out the side and reverses into a short chain with a ring done using each shuttle and the top ring connected to the nearest petal. The bottom ring is joined to one side of the dimpled ring you set aside. The chain curves out from there to join to the tip of the next petal, then switch shuttles to curve the chain in the opposite direction RW to tat the small ring and RW again for the next chain which is joined to the next petal and a short continuation of the chain. This is followed by a long split chain anchored to the side of the small ring. At the end of the long chain is a split ring and another chain going into the tip of the next petal. If you survived to get to this point the mirror flower begins with a split ring split down the middle and the 5th ring is split out the side and follows the same process with the lower ring joined to the other side of the dimpled ring. When you've finished both sides of the heart the thread will be back at the top of the heart. Tat the chain and then the small ring joining between the split ring and the chain on the previous row. 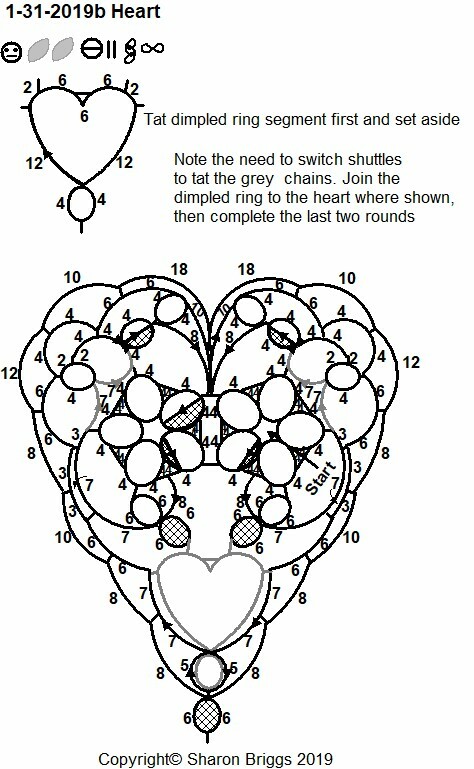 The last bit of weirdness is at the point of the heart where the chain is lock joined between the dimpled ring and the small ring then lock joined to the tip of the ring and lock joined again on the other side between the dimpled ring and the small ring, forming an onion ring. I don't blame anyone for thinking this is a crappy design, I sure do. It possibly takes longer to explain than to tat! I’d like to see the flowers and heart in a different colour, just to make it further complicated! I agree with Jane 😆 And the diagram & process does require some study. I think you're right Jane, but it's such a mishmash< I tried to show what was going on in the drawing but I'm not sure I was successful, which is why there's such a wordy description. Adding a different colour for the flowers and heart will make it even more complex, but I'm sure Muskaan will give it a try. I expect that it will take some design modification for it to work, since there are several split rings to contend with. I'm looking forward to seeing what Muskaan does with it. Just printed out the pattern. I saved and enlarged it in my word doc (so that I can include a pic of the tatted model) and printer setting on fast draft. All numbers, etc. are very clear!